Much encouraged by Tony at Messengers Booker and Jacqui at JacquiWine’s Journal, and also to make some contribution January in Japan, my first new author of 2015 is Yasushi Inoue. Inoue didn’t publish his first novel until he was 42, but went on to be astonishingly prolific, writing 50 novels and 150 short stories. 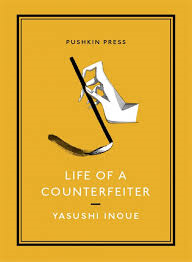 The new translations of two of those novels, Bullfight and The Hunting Gun, by Michael Emmerich, is therefore only a fraction of what he wrote, as are the three stories in Life of a Counterfeiter. The memory becomes associated with a distant relation, Mitsu, who stayed with the narrator’s parents when he was a child. He is aware that she is regarded as a “bad person” – in particular because she only married after becoming pregnant – and that her death at 20 is surrounded by rumours. As he grows older, he takes a more sympathetic view of her life, as he does in the final story, ‘Mr Goodall’s Gloves’, of his Grandmother Kano. She is not his true grandmother, but the mistress of his great-grandfather; the gloves relate to a particular moment of where she was humiliated because of her status. Here the symbolism is clearer; in the other two stories we are left with a more intuitive understanding. ‘Reeds’ actually ends with the sentence, “But I don’t know what makes me feel that way.” This lack of clarity contributed towards it being my favourite of the three stories, but I enjoyed all of them, and fully intend to move onto the two novels. You are currently browsing the archives for the Yasushi Inoue category.